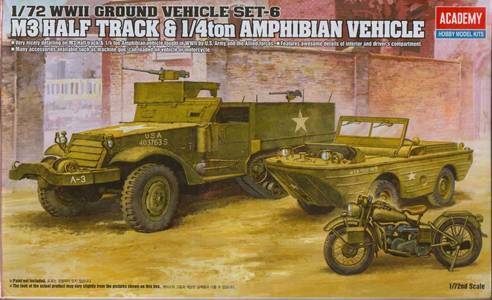 This M3 Half Track comes as part of Academy's "WW II Ground Vehicle Set #6", where it shares the box with an amphibious Jeep and a Harley Davidson motorcycle. For the purpose of this review I dug a bit deeper in my library and learned that the first M3 was produced in May 1941. Minor modifications were added over the production run, like a spring loaded idler in the Fall of 1942, which was reinforced in the Summer of 19433 (Academy gives the latter type.) Early models had a ditch crossing roller on the front bumper, while later models had a winch (Academy offers both.) Mine racks were added to the sides in August 1942 and subsequently retrofitted. Production switched to the M3A1 with a circular MG mount in the first half of 1943. Removable head-lights were introduced in the Summer of 1943, which is the type the kit offers. I decided to build this kit after seeing a picture of a captured M3 in Panzerwrecks 3. The vehicle apparently belonged to 10.(Pi. )/Pz.Gren.Rgt.111, 11. Panzer Division, and was put into use as a gepanzerter Mannschaftstransportwagen M3(a) around December 1944. This clearly was an M3, not an M3A1, and had the striking characteristic that it was fitted with Wurfrahmen to the sides of the hull. I was in for some conversion work. 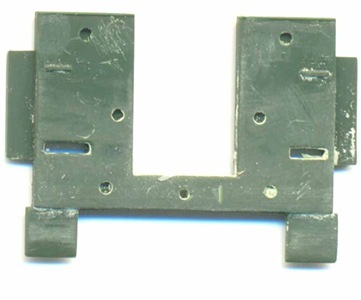 - the central guide rail on the inside of the continuous rubber tracks is missing as is the groove on the outside. I started construction with the tracks, adding both the "groove" and the "rail". I also added a groove to the top return roller. The whole of the tracks assembly can be added to the chassis without the use of glue, which is very practical for the paint-job to come. There is some interference between part A12 (the front axle) and part A2 (chassis), which needs some fiddling. The real idler and drive sprocket were rather flimsy looking affairs, with lots of empty space between the metalwork. Those offered by Academy are anything but that. The front wheels look very nice and do not need extra work. I added the reinforcement rails to the interior stowage bins and a footrest beneath the seats. I saw pictures of the interior of an M3 where there was a third seat in the middle, but I chose not to replicate this. As I was backdating the M3A1 to an M3, I omitted the gun mount and support. The latter fits into a hole in the interior, which I blanked off with a circular plate. When I joined the front and rear hull together, I noticed there was a small gap. At least, if you align the tops of both compartments, which is what I believe you should do. I also omitted the mineracks. It doesn't matter much if you believe it was fitted to the original vehicle or not; the addition of the Wurfrahmen required smooth hull sides, so, if they had been there, they were removed. 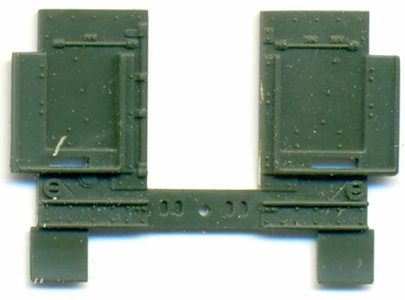 The rear hull plate was almost entirely built from scratch, as the kit comes with a rear plate which has part of the stowage racks molded integrally. Handholds were added to rear hull plate (B12) in the process. I noticed that the rear door is thinner than the rest of the (original) rear hull plates. I don't know if this is correct, but I chose to go for a uniform thickness for my modification. There are some holes on the inside of this hull plate, for which I still not have found the reason. I also omitted the rear mudflaps as the pictures of the vehicle I was building did not show them. There is a small "groove" on the lower edge of rear hull (parts B5 and B6) which I filled in, as I did not see it in any of the pictures I had available. I cut off two small pegs, one on either side of the rear hull, on the top of the fighting compartment, as I did not find any photographic evidence of that either. The armored windshield is far too thick, so I sanded it down. If, like me, you build it opened up, you will need to add supporting rods. A clear window is not provided by Academy, so one was added from scratch. Academy gives you the choice between open and closed engine louvres at the front of the engine compartment, which is nice, as is the choice between a winch and a roller. The kit comes with the late type of headlights, which I duly lost. I replaced mine with modified parts from the spare's box. I also added a spare roadwheel to the fender (from a very old Hasegawa kit), to conform with the pictures. I finished construction by adding Notek lights to the front and rear and adding four Wurfrahmen which I stole from one of Dragon's Sd.Kfz.251 kits (in this case kit 7310). 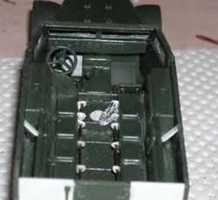 The interior was filled out with some German gear, and a tarp added over a scratchbuilt roof on top of the driver's compartment, to simulate what I saw on the pictures. The MGs that come with the kit are very nice, but were not needed for the specific vehicle I was building. In general, I noticed that most ejector marks are strategically located, except that on the winch and on the inside of the tyres. Fit is also quite good, except for those few steps that are mentioned above. - overspray in German dark yellow and reddish brown.